WHAT HAPPENS when the teenage heirs of two bitterly FEUDING FAMILIES can’t stay away from each other? The Rhodales and the Whitfields have been sworn enemies for close on a hundred years, with a whole slew of adulterous affairs, financial backstabbing, and blackmailing that’s escalated the rivalry to its current state of tense ceasefire. IT’S TIME TO LIGHT THE FUSE . . .
And now a meth lab explosion in rural Whitfield County is set to reignite the feud more viciously than ever before. 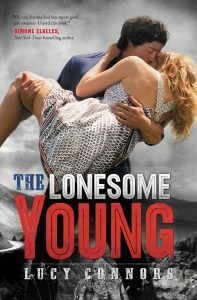 Especially when the toxic fire that results throws together two unlikely spectators—proper good girl Victoria Whitfield, exiled from boarding school after her father’s real estate business melts down in disgrace, and town motorcycle rebel Mickey Rhodale, too late as always to thwart his older brothers’ dangerous drug deals. Victoria and Mickey are about to find out the most passionate romances are the forbidden ones.
. . . ON A POWDER KEG FULL OF PENT-UP DESIRE, risk-taking daredevilry, and the desperate actions that erupt when a generation of teens inherits nothing but hate. Get swept away in the first book of the sensational romantic drama that is Romeo & Juliet meets Justified.